Yellow Perch or Lake Perch, they are the same fish and these are the same wild caught Canadian perch fillets you can get on the rest of the site. 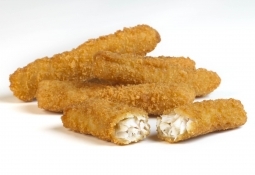 These perch have been filleted, skin left on, and coated with a light breading. You will get between 6-8 per pound. SHIPPING NOTE: We do not recommend ordering only this product alone. The product isn't dense enough to remain cold during shipment and is the product we receive the most complaints about thawing during shipment. Best to be added to a larger shipment or choosing a faster service that you would normally -- especially in summer months. All we could say is awesome and better than some local Supper Clubs. Shipping is a little high , but if you price the cost of 2 people going out for a perch dinner 6 or 7 times, it is well worth the money. Larger filets than I expected. Very light and tasty breading. Fish arrived with dry ice still in the box, and still completely frozen. I bought a special fryer just for the cooking of these. I love perch, and these are VERY GOOD! Shipped and arrived as promised. Great tasting fish. The Perch were received in good shape and they are delicious. The sponsors of this product did everything they said and I will definitely deal with them in the future. I am a transplant from East Harbor near Port Clinton and grew up on Perch, walleyes and crappies. So it was a treat to enjoy this order of Perch. My husband and I are both formerly from Ohio and used to only be able to enjoy perch on our rare visits back. It was a pretty expensive fish dinner...this saves us a lot of money. My husband loves fish and although I'm not a big fish lover, yours is outstanding. Thanks so much for having it available for those of us who are former Midwesterners. Sooo Good!! We do not have fresh water perch in Oregon. Growing up in Wisconsin, it was the one thing I really missed! I have been craving lake perch! When I found WalleyeDirect I was so excited. The lake perch was excellent, even my fish-hating husband liked it. Fresh, Awesome, Born in Michigan. Perch was always my favorite. Thank you for bringing that memory back after 30 years. Look forward to doing business with you again. Wonderful tasting! Breading could be a little thinner. ummm. Perfect breading. Will be ordering more. 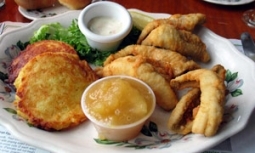 I'm from Erie, Pa and fished for yellow perch as a kid. My favorite. 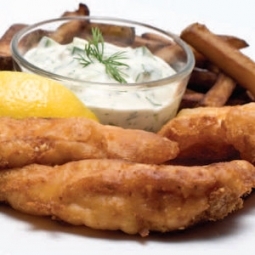 The breaded lake perch is absolutely fabulous!!! We think it's better than restaurant quality. And it is so easy to prepare, I just LOVE it! Ordered and received my breaded perch order.